In addition to indulging in some fun first-runs at the theater, we’ve been digging out old favorites for another viewing. Here are a few that I enjoyed the most! 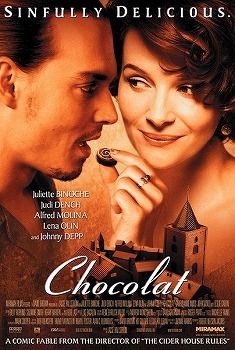 Juliette Binoche and Johnny Depp star in this charming fairy tale about mysterious Vianne – a sensual chocolatier who seems to know exactly what each of the curious villagers needs and desires most. A romantic story of magic and transformation, this cinematic confection is a delight and may bring out the gypsy in you. A deeply moving story of a teacher (John Keating, played by Robin Williams) who challenges his boarding school students to explore new perspectives, live fully and find their passion, this film is an invitation to viewers to re-engage and seize the day. With brilliant performances by Williams and the students, Dead Poets Society is both inspiring and tragic and gets me every time. Carpe Diem! A witty and compelling story combined with fabulous costumes and great performances from an all-star cast…what’s not to love? The film begins with a young Will Shakespeare (Joseph Fiennes) who’s not exactly at the top of his game, but his genius is re-ignited by the intriguing and unconventional Viola (Gwyneth Paltrow) whose passion for the theater is an exhilarating inspiration. A blend of love, comedy and a clever script make this a real pleasure. Loved Nick Hornby’s book, and while the movie is different (the setting change from London to Chicago does change things), it always makes me laugh. John Cusack is great as an underachieving music geek who is seriously challenged in the relationship department, and the role of Barry – the obnoxious but hilarious music snob – was just made for Jack Black. I dare you not to laugh during the “Walking on Sunshine” scene and Black’s musical talent may surprise you. Watch this movie if you’re down in the dumps and feeling sorry for yourself or just need a good laugh. Being a Disney flick, I know it will have superior animation and a stirring soundtrack, but that’s not all that appeals to me. The story calls to me at a time when I have 3 brave princesses of my own, making choices, taking risks and discovering who they are. It’s not always easy as they travel to distant countries and face challenges or just have to deal with the overwhelming array of university choices and make a life-shaping decision. My role tends to be supporter, advisor and coach and those responsibilities come easy when I’m cheering on my daughters. But there’s the flip side of letting go. Listening thoughtfully and knowing when NOT to give advice. Disconnecting and realizing that these young women are becoming independent adults and facing a different world than I did. Encouraging them to fly but not pushing too hard because of my own longing for adventure. I’m not always good at the balancing act. We’re all growing and changing, and we’re all being brave. Here’s to impetuous women dealing with any kind of peril. The difficulties shape us and keep us sharp. 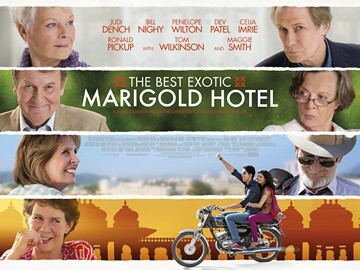 The Best Exotic Marigold Hotel is a fun movie with an all-star veteran British cast. Although India isn’t at the top of my bucket list, the exotic setting is an interesting backdrop that appeals to my adventurous spirit. I liked the balanced mix of engaging stories and humor, and appreciate the fact that older characters have some vitality and depth. Dev Patel provides a youthful contrast to the “highly experienced” cast and steals the show with some great comic moments. Besides being entertaining, the movie is also a social commentary on some of the issues that elders face such as financial insecurity, disconnection and a changing society.